Li, Xiaoyue and Tilt, Bryan 2019. Public engagements with smog in urban China: Knowledge, trust, and action. Environmental Science & Policy, Vol. 92, Issue. , p. 220. Brombal, Daniele Niu, Yuan Pizzol, Lisa Moriggi, Angela Wang, Jingzhi Critto, Andrea Jiang, Xia Liu, Beibei and Marcomini, Antonio 2018. A participatory sustainability assessment for integrated watershed management in urban China. Environmental Science & Policy, Vol. 85, Issue. , p. 54. Halskov Hansen, Mette and Liu, Zhaohui 2018. Air Pollution and Grassroots Echoes of “Ecological Civilization” in Rural China. The China Quarterly, Vol. 234, Issue. , p. 320. Zinda, John Aloysius Li, Yifei and Liu, John Chung-En 2018. China’s summons for environmental sociology. Current Sociology, Vol. 66, Issue. 6, p. 867. Geall, Sam and Ely, Adrian 2018. Narratives and Pathways towards an Ecological Civilization in Contemporary China. The China Quarterly, Vol. 236, Issue. , p. 1175. Zinda, John Aloysius Trac, Christine J. Zhai, Deli and Harrell, Stevan 2017. Dual-function forests in the returning farmland to forest program and the flexibility of environmental policy in China. Geoforum, Vol. 78, Issue. , p. 119. Ma, Jing Mitchell, Gordon Dong, Guanpeng and Zhang, Wenzhong 2017. Inequality in Beijing: A Spatial Multilevel Analysis of Perceived Environmental Hazard and Self-Rated Health. Annals of the American Association of Geographers, Vol. 107, Issue. 1, p. 109. Shen, Yongdong and Steuer, Benjamin 2017. Conflict or cooperation: the patterns of interaction between state and non-state actors in China’s environmental governance. Journal of Chinese Governance, Vol. 2, Issue. 4, p. 349. Kostka, Genia and Nahm, Jonas 2017. Central–Local Relations: Recentralization and Environmental Governance in China. The China Quarterly, Vol. 231, Issue. , p. 567. Turiel, Jesse Ding, Iza and Liu, John Chung-En 2017. Environmental Governance in China: State, Society, and Market. Brill Research Perspectives in Governance and Public Policy in China, Vol. 1, Issue. 2, p. 1. Grano, Simona A. 2016. China’s changing environmental governance: Enforcement, compliance and conflict resolution mechanisms for public participation. China Information, Vol. 30, Issue. 2, p. 129. Grano, Simona A. and Zhang, Yuheng 2016. New channels for popular participation in China: The case of an environmental protection movement in Nanjing. China Information, Vol. 30, Issue. 2, p. 165. Lo, Carlos Wing-Hung Liu, Ning Li, Pansy Hon Ying and Wang, Wei 2016. Controlling industrial pollution in urban China: Towards a more effective institutional milieu in the Guangzhou Environmental Protection Bureau?. China Information, Vol. 30, Issue. 2, p. 232. Liu, Nicole Ning Lo, Carlos Wing-Hung Zhan, Xueyong and Wang, Wei 2015. Campaign-Style Enforcement and Regulatory Compliance. Public Administration Review, Vol. 75, Issue. 1, p. 85. Most of the papers included in this collection were first presented at a symposium hosted in Oxford in March 2011 and organized by the editor. This was made possible by generous funding from the Contemporary China Studies Program (The Leverhulme Trust) and from the British Inter-University China Centre (Arts and Humanities Research Council, Economic and Social Research Council, and Higher Education Funding Council for England). In addition to those included in this collection, the author would like to thank the discussants and participants for their helpful comments. Cai, Yongshun. 2010. Collective Resistance in China: Why Popular Protests Succeed or Fail. Stanford: Stanford University Press. Carter, Neil, and Mol, Arthur. 2007. Environmental Governance in China. London: Routledge. Economy, Elizabeth. 2004. The River Runs Black: The Environmental Challenge to China's Future. London: Cornell University Press. Edmonds, Richard L. 1994. Patterns of China's Lost Harmony: A Survey of the Country's Environmental Degradation and Protection. London: Routledge. Edmonds, Richard L. (ed.). 1998. “Special issue: China's environment.” The China Quarterly 156. Also published as Edmonds, Richard L. (ed.). 2000. Managing the Chinese Environment. Oxford: Oxford University Press. Goldman, Merle, and Perry, Elizabeth J.. 2002. Changing Meanings of Citizenship in Modern China. Cambridge, MA: Harvard University Press. Ho, Peter, and Edmonds, Richard L. (eds.). 2008. China's Embedded Activism: Opportunities and Constraints of a Social Movement. London: Routledge. Holdaway, Jennifer. 2010. 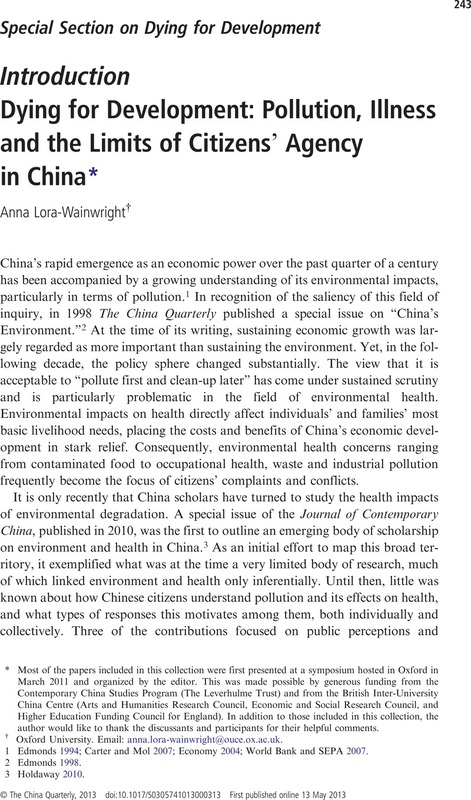 “Special issue: environment and health in China.” Journal of Contemporary China 19 (63). Johnson, Thomas. 2010. “Environmentalism and NIMBYism in China: promoting a rules-based approach to public participation.” Environmental Politics 19 (3), 430–448. Lee, Ching Kwang. 2007. Against the Law: Labor Protests in China's Rustbelt and Sunbelt. Berkeley: University of California Press. Li, Lianjiang, and O'Brien, Kevin. 2008. “Special section on rural protests.” The China Quarterly 193, 1–139. Liu, Lee. 2010. “Made in China: cancer villages.” Environment Magazine (March–April), http://www.environmentmagazine.org/Archives/Back%20Issues/March-April%202010/made-in-china-full.html. Accessed 14 June 2011. Lora-Wainwright, Anna. 2010. “An anthropology of ‘cancer villages’: villagers' perspectives and the politics of responsibility.” Journal of Contemporary China 19 (63), 79–99. Mertha, Andrew. 2010. China's Water Warriors. Citizen Action and Policy Change. Ithaca and London: Cornell University Press. O'Brien, Kevin, and Li, Lianjiang. 2006. Rightful Resistance in Rural China. Cambridge: Cambridge University Press. Perry, Elizabeth J., and Goldman, Merle. 2007. Grassroots Political Reform in Contemporary China. Cambridge, MA: Harvard University Press. Su, Yang, and Duan, Xiaoli. 2010. “Zhongguo huanjing yu jiankang gongzuo de xianzhuang, wenti he duice” (Current situation, problems and responses in China's environment and health work). In Holdaway, Jennifer, Wuyi, Wang, Shiqiu, Zhang and Jingzhong, Ye (eds. ), Huanjing yu jiankang: kuaxueke shijiao (Environment and Health: Cross-disciplinary Perspectives). Beijing: Social Science Academies Press, 25–39. Tilt, Bryan. 2006. “Perceptions of risk from industrial pollution in China: a comparison of occupational groups.” Human Organization 65(2), 115–127. Tilt, Bryan. 2010. The Struggle for Sustainability in Rural China. New York: Columbia University Press. van Rooij, Benjamin. 2010. “The people vs. pollution: understanding citizen action against pollution in China.” Journal of Contemporary China 19 (63), 55–77. Weller, Robert. 2006. Discovering Nature: Globalization and Environmental Culture in China and Taiwan. Cambridge: Cambridge University Press. World Bank and SEPA (State Environmental Protection Administration). 2007. Cost of Pollution in China: Economic Estimates of Physical Damages, www.worldbank.org/eapenvironment. Accessed 25 January 2010. Yang, Guobin. 2010. “Brokering environment and health in China: issue entrepreneurs of the public sphere.” Journal of Contemporary China 19 (63), 101–118. Zhang, Lei, and Zhong, Lijin. 2010. “Integrating and prioritizing environmental risks in China's risk management discourse.” In Holdaway, Jennifer (ed.) “Special issue: environment and health in China.”Journal of Contemporary China 19 (63), 119–136.